The Joovy ScooterX2 is a stylish double stroller with a side-by-side design. Joovy sells this stroller with a kid's tray (which we recommend), and an older model without a tray for the same price. With many user-friendly features for both parents and passengers, we think it is one of the easiest to use in our comparative review. It has large under seat storage, two zippered pockets, two cup holders, and inside mesh storage pockets for little ones. We like the all-around shocks, padded seats, adjustable leg rests, and giant canopy with peek-a-boo window. While Joovy made some improvements to the frame and threw on larger sealed bearing wheels than previous years, we still found maneuverability to be somewhat lacking. As such, we do not recommend it for off-road strolling. Nonetheless, we think this little powerhouse of a stroller is one of the best budget-friendly options on the market for parents pushing two, and we would definitely recommend it to a friend. Joovy is a family company located in Texas and California started in 2005. Joovy designs original products with quality construction that provide functional and fun final gear for everyday use. They offer a variety of baby gear options from strollers and play yards to bottles. The Joovy Scooter X2 is a side-by-side stroller with equal features for both passengers. The Joovy ScooterX2 (in blue) performs well, providing ease of use at a reasonable price point compared to the competition. In the following sections, we detail the Scooter's performance during testing. The Scooter X2 has a variety of useful features like a storage bin, zippered back pockets, dual mesh cup holders and child trays. The features work well and are easy to use. The Scooter excels in the ease of use department with lots of features that work well earning a 7 of 10. Ease of use encapsulates the day to day experience of using a stroller regularly. The Joovy has a manageable fold with several steps (above left). It can fold with one hand but you need to bend to the ground, and it doesn't self-stand. It has seven steps that include removing the child trays and a manual lock (above right). Unfolding is more difficult as it takes two hands and reattaching the trays. The brakes on the Scooter are average for setting and releasing, but they don't hurt sandaled feet. The Scooter has average single action brakes with a sandal foot friendly pedal to set and release. The Scooter storage bin is large enough for an extra-large diaper bag but it has limited access from the back only. The Scooter has multiple storage options with a large bin, zippered back pockets, mesh water bottle pockets, and inside mesh passenger pockets. The bin is wide and fits our extra-large diaper bag, but it is only accessible from the back with a 5 lbs limit. When you recline the seat, the bin is harder to access, and we wish it had front access. You can now purchase the Scooter X2 with two child trays that increase the convenience for little ones. This version of the Scooter X2 also has dual child trays with a small snack area and cup holder for little ones where the bumper bar traditionally goes. The Joovy Scooter has a shared large canopy (above left), but it can't be adjusted to appease individual passengers. It is one of the largest in the group sporting ventilation, and a large vinyl peek-a-boo window with hook and loop closures on the cover(above right). The Scooter has 2 5-point harnesses that work well but are harder to adjust than some of the competition. Each seat has a 5-point harness that is easy to operate. Unfortunately, the straps are more difficult to adjust because they feed through the buckle one fold at a time. The shoulder straps are rethreaded for height and have three positions, while the crotch strap has one position with an adjustable length strap. Adjusting the recline on the Scooter requires two hands and can be harder to operate than some of the competition. Both seats recline independently for comfort. The recline requires two hands and is difficult to adjust. The seats are flat enough for cozy napping though they aren't truly flat. The Scooter has padded adjustable leg rests with side levers that are a little difficult to work. The Scooter is not compatible with any infant car seats. The Joovy Scooter is harder to set up than a lot of the competition taking over 7:30 minutes. The quick start guide was missing some of the steps, and the pages were oriented poorly. The dual front wheels on the Scooter are harder to maneuver than strollers with single front wheels on each leg. Maneuverability is not the strong suit of the Joovy despite the improved wheels earning it only a 4 of 10. Pushing the Scooter on flat surfaces is better than pushing on uneven surfaces. It performs about average thanks to a wide design and a shorter handlebar. Pushing is worse on grass and challenging over gravel. The Scooter's dual front wheels on each leg and plastic construction hurt its overall maneuverability. Overall, it would be easier to manage if Joovy got rid of the dual front wheel design. Two subpar wheels together on the same leg cause the stroller to struggle with precision turning, and the wheels veer off course if one gets caught on a bump. While the swivel wheels can lock into place, the dual wheel design still causes struggling. The Scooter is relatively small and light compared to the competition, though there are lighter and smaller options if your space is limited. The Scooter is relatively light and small compared to the competition. It is 31.8 lbs earning it a score of 6 of 10. The Joovy folded size measures in at 18,188 cubic inches which is smaller than the average of over 18,900 cubic inches. For the price, Joovy offers nice quality construction and design with thoughtful well-designed features. The Scooter scored above average for quality with a 6 of 10 bringing enough quality to the table to stay competitive, without adding extra expense to the bottom line. The fabric on the Scooter is a little coarse, and we were able to snag it in our tests. The seats themselves have decent padding for comfort, and we like the smooth feel of the harness straps. The frame is tight with little flex, and it doesn't rattle or wobble. The overall fit and finish are clean with a nice design, well-fit fabrics, and tight connections. While the Scooter's front wheels swivel and can be locked in place, it doesn't improve maneuverability over uneven terrain as well as we hoped. The wheels on the Scooter are plastic. They are larger and arguably better than the previous version, but we think it would benefit significantly by having rubber tires and a single front wheel design (1 wheel for each leg as opposed to 2). The handlebar is a stationary bar that isn't bad, but it has a plastic section in the middle that prohibits one-handed pushing and makes it difficult to find a great place to hold. The Scooter has a comfortable riding experience for passengers with a cozy napping space that includes a deep recline, adjustable leg rest, and canopy. This stroller has all-around shocks that are relatively nice, but not adjustable. The suspension coupled with nicely padded sling style seats means little ones are in for a comfy ride. The Joovy Scooter is a good choice for older twins, but the inability to use it in conjunction with infant car seats means it isn't good for younger babies. 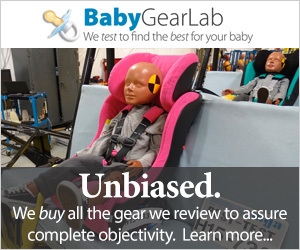 Because the Scooter does not accept infant car seats, it is a poor choice for infant twins. However, the identical rider experience is a good fit for children of the same age to help reduce the likelihood of an argument. The Scooter's budget-friendly price will also be attractive to parents of twins making it a potentially good choice for older babies. Joovy claims the minimum age for this stroller is three months, but we think the Scooter could be a good choice to pair with the Joovy Twin Roo+ a great frame stroller that holds two infant car seats, has a giant storage bin, and four cup holders. The Twin Roo+ is economical with a price tag around $130, and even when coupled with the Scooter price of $280, most parents will still be saving money over strollers that accept two infant car seats and work for older twins. The Joovy Caboose Ultralight Graphite is an interesting sit and stand stroller that is relatively small and lightweight. It accepts one infant car seat, and you can purchase a second seat for the back bench. This stroller is not good for infant twins, but it is an interesting option for two children of different ages. The Joovy Twin Roo+ is a neat frame stroller that works with a variety of infant car seat brands. It earned an honorable mention for twins with a large storage bin, four cup holders, and two car seat capability. The stroller has a reasonable price and can be combined with the Scooter to create a birth to 45 lb stroller solution for twins. Amazon $235.97 - 16% off!